After enjoying a fairly relaxed morning in Meyers Chuck (and a delicious cinnamon roll) we got underway, bound for Anan Creek Bear Observatory. I’d spoken with a ranger about visiting when I was in Ketchikan and he said we were welcome to go without a permit until July 5th. This is because the salmon don’t start running until early July, and without salmon in the stream the bears are feeding elsewhere. Ordinarily I might skip Anan under such conditions, but Mark had never been. Even if there aren’t any bears, it’s a pleasant stop with a nice walk. The trip up to Anan was uneventful but a bit windy—winds to 25 knots, I’d estimate, but without too much fetch. When I arrived at Anan I was shocked by the number of crab pot buoys. There must have been a buoy every 20 feet, four deep and1400 yards long, all right where I wanted to anchor. Anan is a tough anchorage anytime, since it drops off rapidly from 20 feet to hundreds of feet. If you anchor in 20 feet and swing towards shore, you’re aground. If you anchor in 150 feet, you probably can’t get the anchor to set. And if you anchor somewhere in between and drag away from shore, the anchor won’t reset and the boat will quickly drift away. I managed to find a spot to drop the hook in about 60 feet of water. With 250 feet of chain out I got a good set. Mark rafted along side and we headed to shore in the dinghy. The trail up to the observatory was filled with evidence of bears…fur on trees, poop in the trail. But, as predicted, we didn’t actually see any bears, either on the trail or at the observatory. Thankfully our boats were still sitting at anchor when we returned. We set course for Berg Bay. Unfortunately when we arrived it was as cluttered with crab traps as Anan was. I tried to set the anchor four different times, all unsuccessfully. So we continued on to Madan Bay. Easy anchoring for a change! 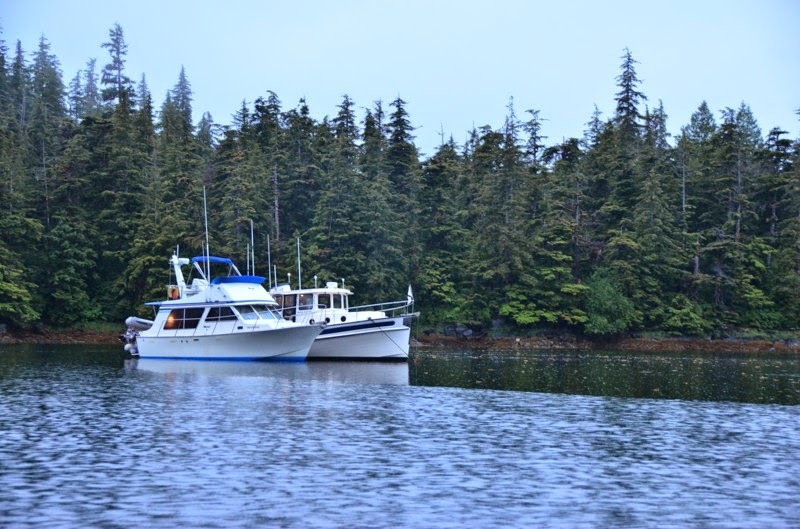 Sea Raven and Safe Harbour rafted in Madan Bay.